Zack: In your estimation, how will the ordinance benefit this particular part of our county? Chris: Well, it’s going to provide people who are working for a living with a wage that’s much closer to a living wage and I think that’s important because it’s gonna allow families and workers who work and live in Eureka the ability to afford a better quality of life. And it’s going to allow people to afford to live in the neighborhoods that they work in. Specifically, if you’re working minimum wage, you’re taking home about $1,200 a month, give or take. For somebody, under the Minimum Wage Ordinance, it’s gonna bump them up to $1,700 a month. So it’s going to provide about $500 a month per full-time worker – extra take-home pay each month. That can allow you a lot of things, especially when you’re looking at rent, you know, $600-$800 minimum, if you’re lucky enough to find a spot for that. And how it benefits people who are, you know, more than just the lower-wage workers – how it benefits the entire community and the economy – is that per 1,000 low-wage workers, it’s gonna pump an extra $2.5 million into the economy. We know that our economy is stimulated by spending. And so when folks who are working have more money to spend, their gonna be able to take their family out to a movie, or to the show, or be able to go out to ice cream with their family, or spend a little extra in the local stores… do something that they can’t normally do. So that provides them with a much, much better quality of life and more economic security, but it also stimulates our economy. And that additional spending is going to bring more people to open up businesses to take advantage of the increased spending. Our economy is spending driven, you know, it’s like 70% of the economy is driven by spending. The best way we can grow our economy is to make sure that those who are willing to work for a living have a decent quality of life. And that’s the whole fairness issue that this ordinance addresses, it’s crucial; is that it says to big corporations that if you’re going to come into our community… they take a lot of stuff, they take a lot of things from our community. They ought to pay their employees a decent quality of life. I think that’s just a basic fairness issue. Zack: Is this just an economic “shot in the arm”? What is the significance of the increase being indexed for inflation? Chris: (Laughs) Yeah! And so it hasn’t worked out to rely on our politicians to always do the right thing for working families. But what’s amazing to me is that this coincides with this tremendous increase in corporate wealth and profit, and they haven’t been willing to have a shared prosperity with the actual workers. They’ve kept minimum wage relatively low while their profits have ballooned. And I think that is what is inherently wrong. And that’s one of the problems with our economy. Zack: They don’t let it trickle down. I’ve never seen it trickle down. Chris: Ya, it’s never gonna trickle down! It’s totally the opposite of trickle down. And I tell people when I walk door-to-door that I believe in a bottom-up economy. You know, let’s make sure the people who are willing to work for a living have money to spend, and that’s going to stimulate our economy. We’re never gonna be able to give all the tax credits and breaks to the wealthy and think that it’s going to trickle down. That’s been a disaster for working families. Zack: The wage increase will apply to people working in exchange for Welfare benefits, like Welfare-to-Work and CalWORKS. Do you think an increase to a livable wage will make this transition more achievable and stable for those individuals who are trying to move away from a reliance on social services? Chris: Yes, absolutely. That’s a great question. I don’t know if I have much more to add than: It will. And that’s a great point. I think that’s the unfortunate thing, for people who are willing to work and trying to be productive members of society, you know, it’s forcing them to take two or even three jobs. And you know, it’s just not good for them, it’s taking them away from their family and away from their kids, and society has to pay for those costs anyways… so ya, I think it’s going to be great for families and those in that particular situation. We pay for it. I see it with The Boys and Girls Club, is a great example. I volunteer with the kids there, and a lot of their family members are lower-wage workers, homecare workers for example, they come from the hospital in scrubs. They’re working lower-wage jobs. You know, we’re feeding them, and then we’re getting their homework done. But it just occurs to me, when they come to get their child, you know, why are we promoting an economic system – for these people that are willing to work – that is keeping them away from their kids? It’s just like, we’re paying for it with services… we have to pay for services anyways, so it would be better to strengthen those who are willing to work and make sure that they have a good quality of life and that they’re family unit is strong. Chris: Yeah, totally. It’s like trying to keep people down or something. Zack: In your view, What is the primary purpose of economic development? 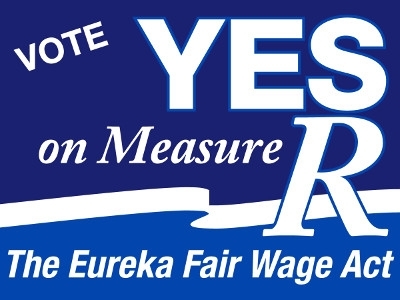 How will your views on other issues – like the General Plan Update – benefit the lives of workers in Eureka? Chris: Well, for me, the primary purpose of economic development is to help folks who are willing to work within the 4th District, and within Humboldt County, have the ability to find a job, and a job that affords a good quality of life. Dignity – because it allows you to live, work and raise a family in the city that you work in. In terms of the General Plan, by encouraging investment in the city centers where we have infrastructure, it provides more affordable options for families to live closer to town and closer to services where they’re not as dependent on a car, for example. It’s providing the option for workers to be able to live [in a way in which] they’re not as dependent on a car. And if you have to make a car payment, and you have to pay for insurance, and you gotta put gas in your car – if all your movement is auto-related – that’s a tremendous cost or burden on working families. So to have that option to live where your kids can play, and you can get to the grocery store without having to have a car, or two cars, for example, that helps relieve economic burden on working folks. The other thing is that when we have investment in the City, and we have more “eyes on the street”, as the saying goes, there’s a synergy that’s created, and that is more likely to bring economic opportunity for families than if we just allow the conversion of our timber and agricultural lands and we see more empty buildings and the population shifting further and further out of town. Zack: Bus prices here are pretty crazy. Chris: (Laughs) Bus prices are really expensive! I loved, when I went to Humboldt [State], the JackPass, which allowed me to go for free on any of the routes they serve. Zack: They don’t do that for CR [College of the Redwoods] students anymore. Chris: I know! They inexplicably voted that down, which was so silly… Yeah, I’d like to get that changed, to encourage more people to take advantage of public transportation. Zack: Does a higher minimum wage from large retailers and fast-food chains necessarily mean a higher cost-of-living for everyone in the city? Chris: Most studies show – the data shows – that it doesn’t. That really, the cost of living increase is far exceeded by the increased revenues in the economy and additional hiring that comes with a more robust economy, so it really offsets the idea that there’s a cost of living increase. Right now, so much of our money goes into paying for services, like you said, for the working poor. We just don’t have an economic system right now that’s truly fair. Because people who are working we’re subsidizing with tax dollars directly, because they don’t make enough to live. It’s keeping people down that way. It’s really hard to ask somebody to be able to give back to their community when you’re forcing them on the fringe. When you’re living paycheck-to-paycheck, and living one medical catastrophe away from bankruptcy… we have to allow people who are working to share in economic prosperity. And when that happens, people are much more willing to give back to their community, to volunteer, for example.